Not too long ago, a CF Mom asked a question to a CF forum on Facebook about how other families deal with Cystic Fibrosis treatments and school. I thought I would share a bit about our routine and how we have learned to handle the additional stress of caring for CF while also being on time for school. I would love ideas from other families - of ways to make the morning go more efficiently! In the morning, clothes go on first. The boys share a bedroom. 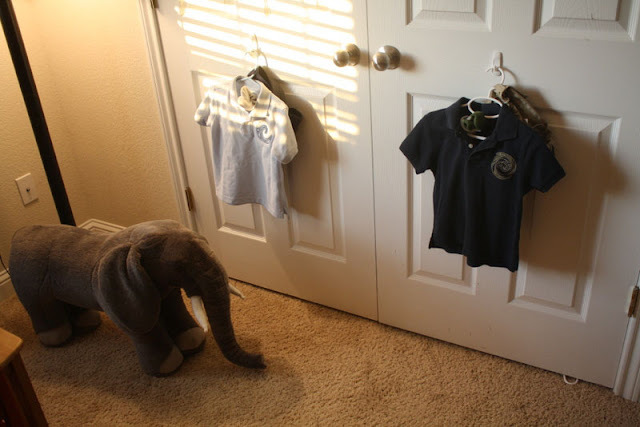 So, I hung little hooks on the boys doors where I will place their school clothes each night. That way, dressing for the day is much easier for them as well as for Dad who helps dress them. I will often do this on the weekend as well. It cuts down on battles on what to wear because the decision has already been made then night before. I hang their clothes on a single hanger (looping their shorts/pants through the hanger) and stuff their socks and underwear in their shirt. They have a basket where they keep their shoes so those are easy to find as well. 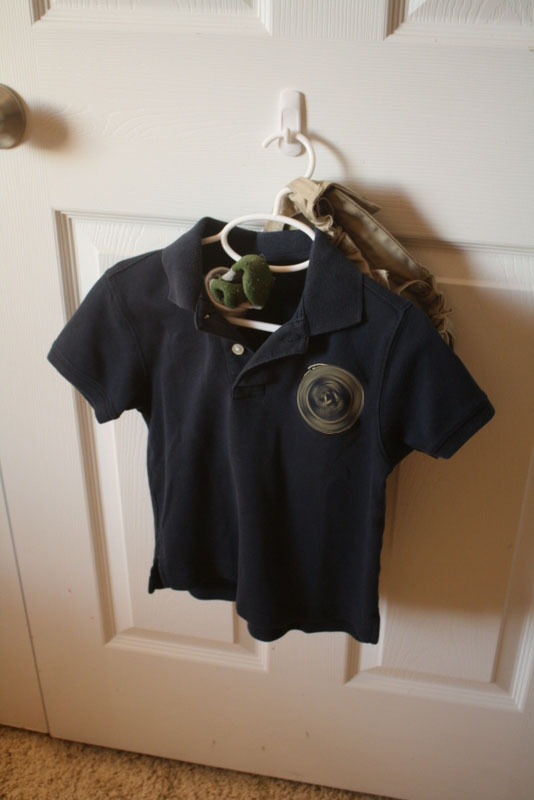 From my experience, locating items for school is half the battle so we've learned how to counteract that. I probably won't win the "best mom" award in the breakfast area as we allow the boys to eat poptarts, donuts, cereal and cinnamon rolls. But the morning time is limited so we prefer quick breakfasts. The nice thing is most of the items we eat in the morning, the children can get themselves. So, this saves time. Treatment must start 30-45 minutes before time to walk out of the door. Brian is a rock star at this one. Each morning, while I am still getting ready for the day, Brian sits with Bennett to watch morning TV while he does his breathing treatments and percussion therapy. We try to make sure Bennett has begun his therapy at least 30 minutes before we walk out of the door so that we provide plenty of time for crying, whining and an overall need to coax him in to treatments. Fortunately, he's usually compliant. Shoes go on during treatment time. Oliver enjoys getting to watch TV with Bennett in the morning. During the last 5 minutes, we put shoes on. Once treatments are done, we're ready to walk out of the door. Ultimately, treatments come before school, even if that means we're late. Daily medications are given at night, if possible. Whatever we can not do in the morning, we don't. Morning time is limited and we'd prefer to use any extra time to sleep. So, daily medications are given at night. We do the same thing. every. day. This is the thing I feel like I have learned about the importance of caring for a Cystic Fibrosis child, if I don't do the same thing every day, I forget. We have many times forgotten to do treatments on a Saturday as we'll tend to want to sleep in and get out of our schedule. So, I feel like the best way to care for my CF child is to do the same thing, every day. Routine is vital. Homework is done immediately after school and on the day it comes home. This is great, Jenny! Knowing ya'll have a similar schedule makes me feel even better about ours. I am glad to hear Bryce gets on his vest first thing in the morning. We tried that this morning and Bennett did great. We even got done early. Glad to know Bryce eats in the car. Good idea! Thanks for sharing! This is so helpful! !